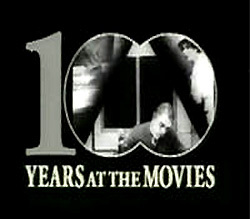 This short film, 100 Years at the Movies (1994), a Turner Classic Movies (TCM) Production, was compiled by film-maker Chuck Workman to celebrate "100 Years at the Movies" for the 1994 Academy Awards show. It was about nine minutes long and included a montage of clips (and music scores) from at least 225 movies - the most important movies of the 20th century. Earlier, Workman had directed a film titled Precious Images (1986), with short clips from films of 50 years of cinematic history. The list below attempted to identify (as accurately as possible), in detail, the many short clips that were included in the film. Suggested Links to "100 Years at the Movies"
She Done Him Wrong (1933) - Mae West (as Lady Lou) delivering her immortal line to Cary Grant (as Salvation Army Capt. Cummings): "Why don't you come up some time 'n' see me?" Grand Hotel (1932) - Greta Garbo (as ballerina Grusinskaya) uttering her famous words: "I want to be alone." Tarzan, the Ape Man (1932) - Johnny Weissmuller (as ape man Tarzan) swinging through the jungle on vines, yelling his "signature" call of "Aaah-eee-aaah"
Dinner at Eight (1933) - Wallace Beery (as corrupt executive tycoon Dan Packard) telling his brassy wife Jean Harlow (as Kitty Packard) to "shut up, shut up"
David Copperfield (1935), aka The Personal History, Adventures, Experience, and Observation of David Copperfield, the Younger - W.C. Fields (as indebted Mr. Micawber) emerging through roof: "I have arrived!" Gunga Din (1939) - a native Thuggee cult member riding horse, and waving saber in "charge"
Mutiny on the Bounty (1935) - Charles Laughton (as tyrannical Captain William Bligh) accusing Clark Gable (as First Mate Fletcher Christian) of being a mutineer: "You mutinous dog!" To Have and Have Not (1944) - Lauren Bacall (as cute Marie Browning) to Humphrey Bogart (as charter boat operator Harry Morgan) after two kisses: "It's even better when you help"
Meet Me in St. Louis (1944) - a home-style minstrel shuffle between Judy Garland (as teenaged Esther Smith) and Margaret O'Brien (as morbid kid sister Tootie), singing and dancing in straw hats with canes to the number "Under the Bamboo Tree"
The Maltese Falcon (1941) - Humphrey Bogart (as detective Sam Spade) uttering the film's last line while touching the worthless black bird: "The, uh, stuff that dreams are made of"
Citizen Kane (1941) - the film's sole musical number, during the newspaper's celebration party: Orson Welles (as Charles Foster Kane) with dancing chorus girls carrying rifles, singing "There is a man - a certain man..."
It's a Wonderful Life (1946) - James Stewart (as small-town hero George Bailey) running down hometown Bedford Falls' main street after receiving a new lease on life, and yelling "Merry Christmas"
All About Eve (1950) - Bette Davis (as aging Broadway diva Margo Channing) memorable warning to assorted party guests as she starts to climb stairs: "Fasten your seat belts, it's going to be a bumpy night"